FILE - Newly elected members of Syria's parliament attend the first parlimentary session of the new constitution in Damascus, May 24, 2012. Syrian President Bashar al-Assad’s ruling Arab Socialist Ba'ath Party would win a landslide victory in any parliamentary elections held either in the next few months or during a political transition following a permanent cessation of hostilities in the war-ravaged country, election experts and diplomats warn. President Assad Monday announced parliamentary elections for April, issuing a decree for polls to be held for the country’s 250-member legislature, known as the People’s Council, which is elected for a four-year term from 15 multi-seat constituencies. The election announcement is being dubbed a PR gimmick by opposition politicians and election experts, who argue that even in the highly unlikely event the vicious five-year-long Syrian civil war ended abruptly in the next few weeks, any such election would fail to meet acceptable international standards. Syrian men pose for a picture as they gather in the Marjeh square in Damascus, Syria, Tuesday, Feb. 23, 2016. The Syrian government and the main umbrella for Syrian opposition and rebel groups announced on Tuesday they both conditionally accept a proposed U.S.-Russian cease fire that the international community hopes will bring them back to the negotiating table in Geneva for talks to end the war. “It would not be in line with any standards,” says Vladimir Pran, a consultant for the International Foundation for Electoral Systems, a Washington-based non-profit that provides technical assistance for elections in new and emerging democracies. IFES frequently partners with the United Nations to organize post-conflict elections. “There would be several problems on so many different levels — and that is even before you take into account the Assad regime wants to hold an election during wartime. No one in the international community will recognize the April polls, if they go ahead,” he added. Aside from the April election proposal, Western diplomats are trying to get opposition politicians and Western policy-makers to think ahead, and more deeply, about a political transition in Syria. They warn that without complete reform of the country’s election law, which would prevent millions of refugees and Syrians displaced inside the country from voting, Assad’s Ba'athists and allies would score a huge victory in a parliamentary poll — due to a system of block voting. Russian diplomats appear to understand the quirks of Syrian election law — they tabled a demand recently during behind-the-scenes international talks on a political transition for the war-torn country’s election law to be left unchanged. “The Russians appear to be thinking several chess moves ahead of us,” admitted a European diplomat based in Istanbul. “They are already maneuvering, trying to shape what happens to ensure that the regime remains in power, with or without Assad,” he says. The diplomat asked that his name be withheld. Under Syria’s current law, electors vote for multiple candidates with several seats assigned to each constituency. The voter has up to as many votes as seats available and the candidates with the highest vote totals win the seats. This gives an advantage to the more developed and established parties. “Even in a political transition with a free and fair environment, the block vote system would work against the opposition because it is so fragmented. Block voting would favor the regime with a disproportionate advantage, amplifying its vote, giving it an overwhelming edge while minimizing the representation of parties that have received sizable minorities of the vote. The party that has even a slight lead in the popular vote wins all the seats in the district,” said Pran. “You saw the consequences of block voting in the Palestinian elections in 2006 when Hamas, on 44 percent of the vote, won the lion’s share of seats in the Palestinian Legislative Council, almost double what Fatah won, even though Fatah attracted 41 percent of the popular vote,” Pran said. There are also other provisions in the current election law which would undermine any polls held under it being an accurate reflection of popular will. More than 2.3 million Syrian adults are refugees, and 3.3 million other voting-age Syrians are displaced within the country. Under the current law, they would have no right to vote, although the Vienna peace deal framework states that all Syrians, including the diaspora, should be eligible to participate in elections. FILE - Displaced Syrians fleeing areas in the northern embattled province of Aleppo, sit under a truck at the Bab al-Salama camp, set up outside the Syrian city of Azaz on Syria's northern border with Turkey, Feb. 12, 2016. At least 120,000 Syrian Kurds also have no eligibility to vote under a 1962 nationality law that stripped them of their Syrian citizenship. Some subsequently were given back their Syrian nationality under a 2011 presidential decree, but the number of disenfranchised Kurds could be much higher than in 1962 because of knock-on effects on the voting eligibility of offspring. Election experts worry also about the oversight powers provincial governors wield under the current law. Nomination committees vet candidates, deciding who can stand. The committees are appointed by the governors. “The Russians appear to be taking a leaf out of their Ukraine playbook,” says another Western diplomat. “Assad’s April election proposal — and the Russians’ early attempts to ensure block voting remains for any political transition — reminds me of the sham separatist vote in Donetsk,” he added. 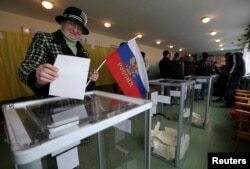 FILE - A woman holds a Russian flag as she casts her ballot during the referendum on the status of Ukraine's Crimea region at a polling station in Bakhchisaray March 16, 2014. In May 2014, pro-Moscow separatists in the Donetsk and Luhansk regions held a referendum on secession from Ukraine. Analysts and Western governments said the referendum was marred by fraud, criticized the process for observing no proper controls over ballot papers or voter lists and questioned the integrity of a vote that was held while separatist intimidation and abductions were going on. The referendum was viewed widely by the international community as a bid to polish the separatist agitation with an electoral sheen. The last time Syrians voted in parliamentary elections was in May 2012. FILE - Women vote at a polling station for a parliamentary election, in Damascus, May 7, 2012. The Assad regime proclaimed the election law adopted weeks earlier was a historic step for reform as it introduced for the first time a multi-party contest. Nine newly-licensed parties challenged the front dominated by the Ba'ath Party, which has ruled since 1972. The election announcement came on the day when regime forces launched a fresh assault on anti-Assad rebel strongholds in the country’s northwest. The election result handed the Ba'ath party and allies 168 seats in the 250-seat legislature. The opposition received six seats with the remainder going to “non-partisans,” most considered regime placemen.